When I first started this blog I was debating between Our Cape on Cabot Rd or Cozy Clean and Simple as names for the blog . I chose the latter. After several months with the Cozy name, I regretted not using my first idea of Cabot Rd. 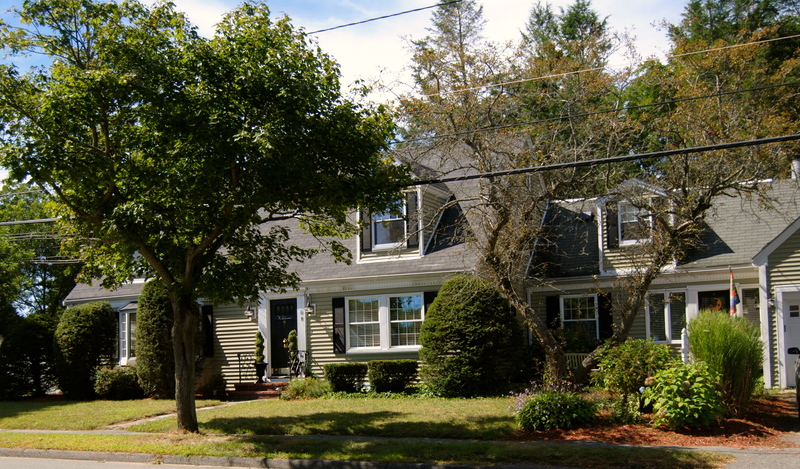 The Cape on Cabot Rd has been my home for the past 27 years….this was the first home for us, our children’s only home, and the home my husband actually grew up in. 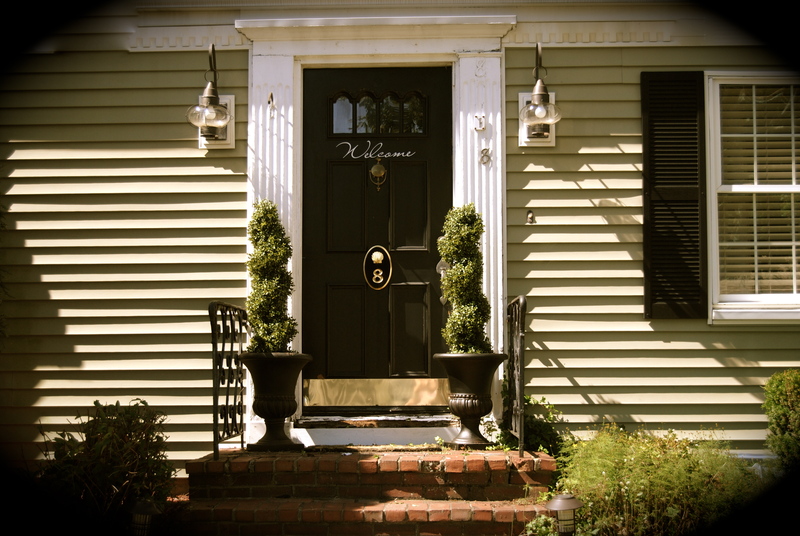 When we bought this house it was white aluminum siding with black shutters and heavy black wood manual garage doors. The bay window was originally 3 windows in a row. We have since done several remodels, both big and small, but have grown to love our changes and homeowner experiences throughout the years. And of course, my favorites are topiaries. I added these this summer in black urns and give a nice finished, neat look. 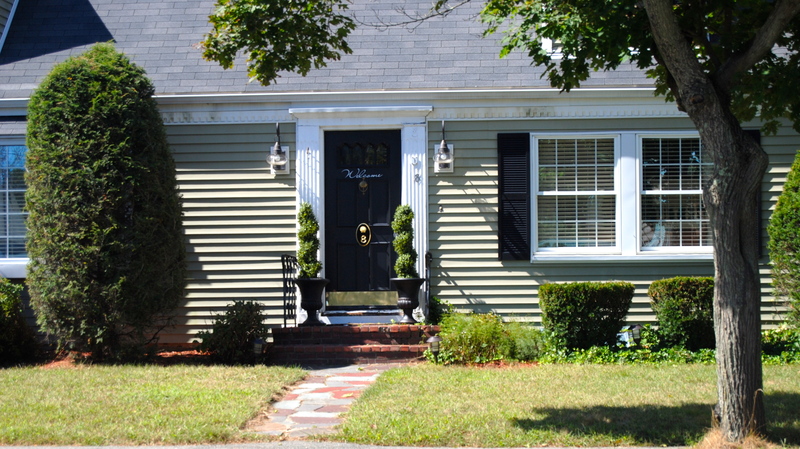 The color of the house is actually a sage green with black shutters. The white trim along the house is actually dental molding but it is hard to tell in the photos. 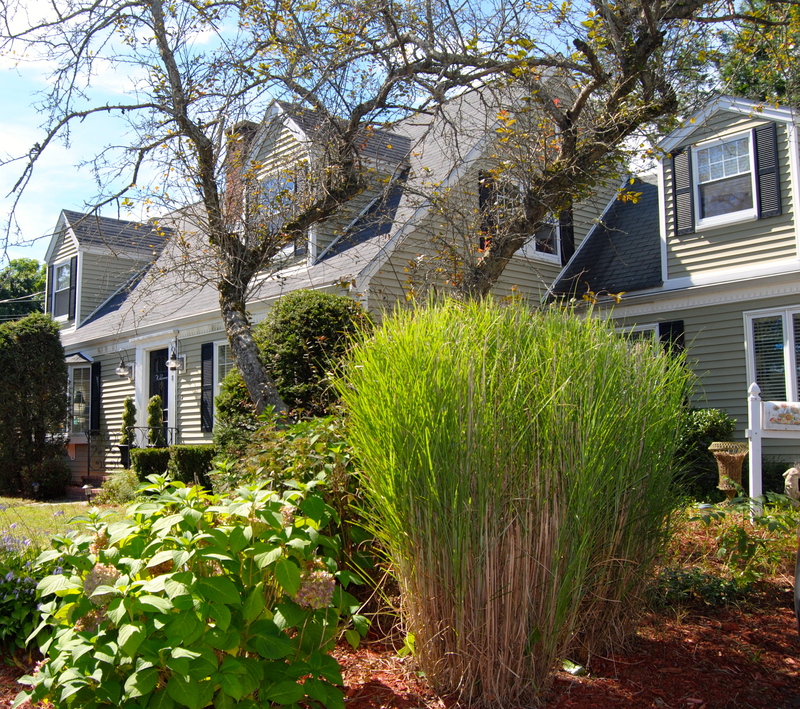 It adds a classic look to a classic style Cape Cod home. From the outside of the home it looks like a typical Cape Cod style home. After our renovations and additions you wouldn’t notice the changes unless you looked from the sides or the back. We added a large 25×16 room family room off the back with cathedral ceilings that has a floor to ceiling windows. 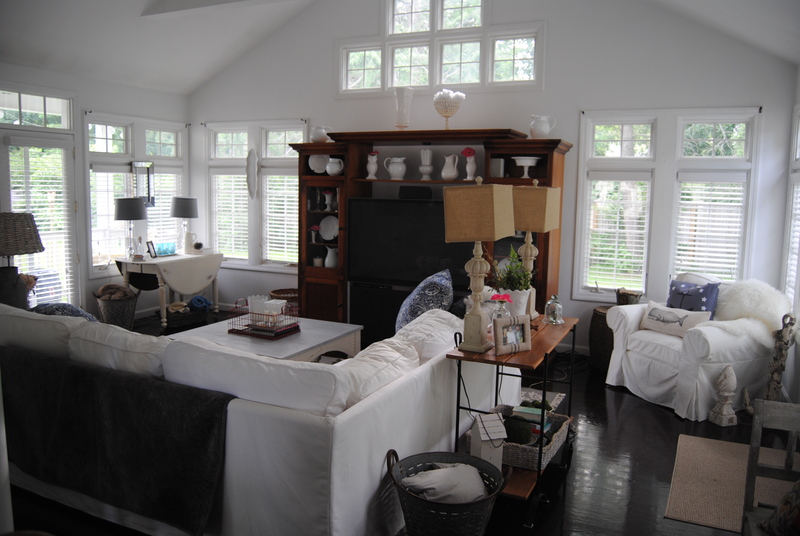 ( Family room photos in previous posts will show) We love this room so full of light and openness. There has been a lot of great memories, changes, and transitions that occurred here and so, I feel it is only fitting to change the name to the place that we call home…. Our Cape on Cabot Rd. The garden on the right has perennials that have been planted over 35 years ago, including tiger lilies, lily of the valleys, and a gorgeous creeping ivy that even goes up the shutters of the kitchen window. We have since added my favorite hydrangea, tall grasses, and peonies. I love the way the colors change throughout the seasons. 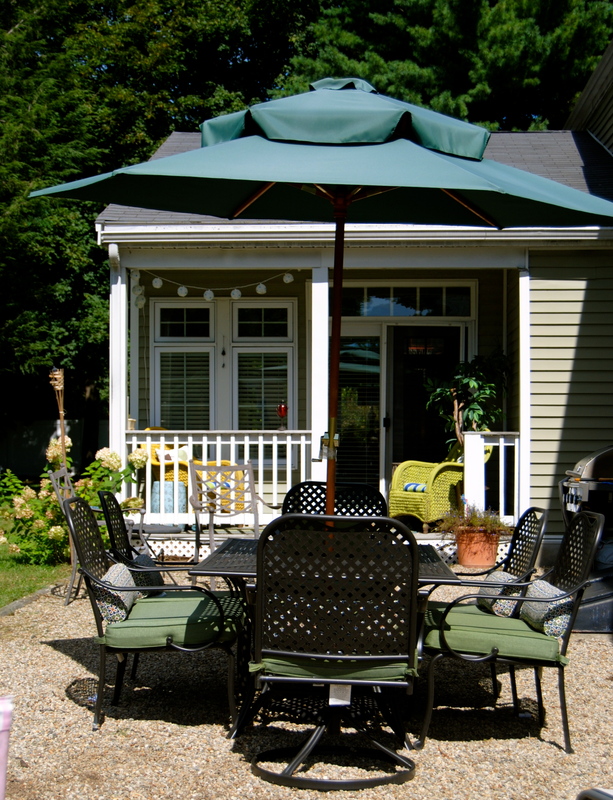 We also added a pea stone patio area off our small but cozy porch off the family room. Pillows and cushions from Homegoods. 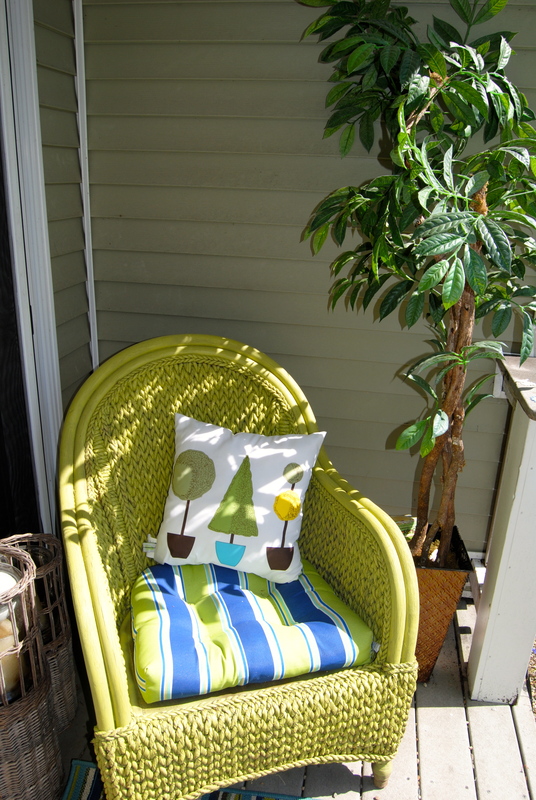 These chairs were just brown sea grass and I had them for several years. 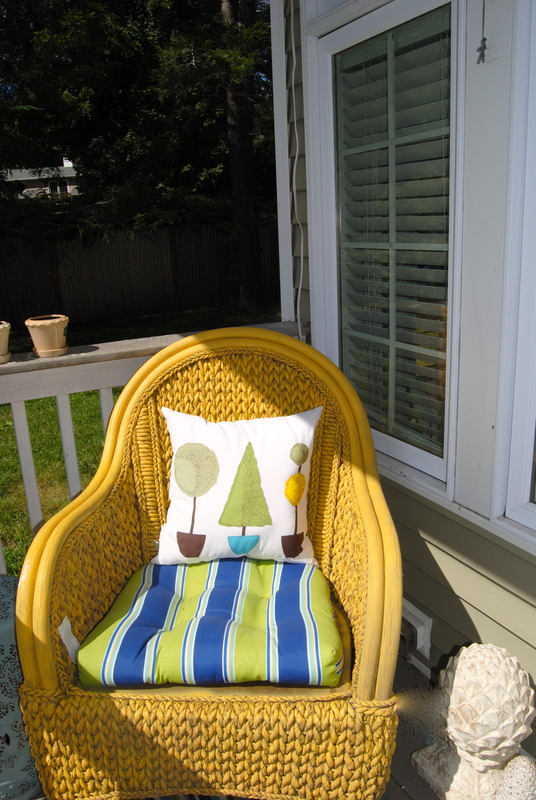 I painted them with spray paint and added fun colors and pillows to brighten things up. Great place to read or drink coffee in the morning. My only regret with this porch is that we didn’t make it larger. Well, that’s the story of our home on Cabot Rd. Stay tuned for even more changes to come. Hopefully you feel the same way about your home as well and can relate to my change of heart with the name. Autumn Decor Ideas- thanks to Houzz!